Christmas has arrived at EdwardRingwald.com! As 2011 fades into the sunset and 2012 rises at dawn, I want to wish everyone a Happy New Year! In Spanish, Feliz Año Nuevo! In Slovenian, Srečno novo leto! And in German, Glückliches neues Jahr! If any year was newsworthy, 2011 was it. We started out 2011 here in St. Petersburg with the unfortunate loss of three St. Petersburg Police Officers and the funeral services that followed. Right as the funeral for Officer David Crawford was wrapping up another horrific news story was in the making across the bay in Tampa, and I watched the events unfold on Bay News 9: The horrific murder of Beau and Calyx Schenecker at the hands of their mother, Julie Schenecker. Later on down the road in 2011 the Space Shuttle program came to an end with the launch of Space Shuttle Atlantis. I remember very well when the Space Shuttle program started in 1981 and the horrific explosion of the Space Shuttle Challenger in 1986; in fact, I was just coming out of classes at St. Petersburg College for the day and I was on my way home when I heard on the radio in my car that the Space Shuttle exploded after liftoff. And we can't forget the biggest news story of 2011: Casey Anthony, found not guilty in the death of her 2-year old daughter, Caylee. The trial, held in Orlando for seven weeks, had a jury that had to come from Pinellas County due to the extensive pre-trial publicity. I was watching bits and pieces of the Casey Anthony trial on Bay News 9 at home, especially the closing arguments, and I thought Casey Anthony would be found guilty either as charged or on a lesser charge. I was at work watching Bay News 9 in the conference room next to my office when the verdict was read: Not guilty. The only offenses that Casey was guilty of was the four counts of lying to law enforcement. I was shocked to see a not guilty verdict. There was a major uproar over the verdict after it was read; the Pinellas County jurors were fearing for their lives which is why the names of the jurors were not released for a few months. Unfortunately, this is how the American system of justice works. We also have seen the end of a tradition which was on WMNF 88.5 FM for 25+ years: The end of the Polka Party Express, which aired its last show on Sunday, 20 March 2011. According to a blog entry I wrote earlier this year when the Polka Party Express pulled out of the station for the last time, it felt like the day when Amtrak pulled out of St. Petersburg for good in 1984. Moreover, we also lost a Slovenian polka music legend on 29 September 2011: Lojze Slak. I enjoyed his music all the time, especially when it was played regularly on the Polka Party Express. My favorite Lojze Slak tune of all time? Glas Harmonike. And we can't forget the first ever national test of the Emergency Alert System on 9 November 2011, which took place at 2 PM Eastern Time. The test from what I understand was far from perfect: The audio was garbled or hard to hear depending on what station you were tuned to as well as stations not even getting the test in the first place. If we want a better national warning system, it needs to be fixed. Remember the reliable Emergency Broadcast System that served its purpose from 1963 to 1997? If you were growing up in that era (especially from the late 1960's onward) and you were watching Saturday morning cartoons, during commercial break a scary slide came on - sometimes with the Civil Defense symbol - and the infamous "this is a test" and the dreaded two-tone signal. Luckily, the Emergency Broadcast System did not have to be activated on a national scale, with the only exception being the EBS mishap in 1971. So, if any year was newsworthy (other than the St. Petersburg Times writing scare stories about house values and the real estate crisis, thank you Mark Puente), 2011 was it. Did I mention the St. Petersburg Times? When 2012 dawns come Sunday, 1 January 2012 the St. Petersburg Times will be known under a new name: The Tampa Bay Times. To me, this is a mistake. Why? 4. We St. Petersburg residents are not part of Tampa nor Hillsborough County. In fact, it is the St. Petersburg Times that championed the cause for the creation of Pinellas County from the western part of Hillsborough County in 1912. In 2012 we celebrate 100 years of being a county separate and apart. The St. Petersburg Times may be changing its name to the Tampa Bay Times come Sunday, 1 January 2012. However, it will continue to be the St. Petersburg Times in my book. Christmas 2011 has come and gone, and I hope everyone had a Merry Christmas! Hopefully you got what you wanted and Santa was good to you. 1. Check your store's return and refund policy carefully. Note any fees you may be charged such as a restocking fee, especially for computer and electronics equipment. You can find out an individual store's policy just by going to their web site and clicking on the customer service link. 2. Bring your original sales receipt with you. This will eliminate plenty of inconvenience when you go to exchange or return an item. If you do not have your original receipt with you, more than likely you will be offered store credit so that you can purchase another item. Again, check your store's return policy. Adhering to store policy and bringing your original receipt should make your return or exchange a breeze. However, there is an alarming trend with retailers when it comes to exchanges and refunds, and that is requiring ID and at the same time capturing the information on your ID! Just recently Best Buy has enacted a policy that requires ID from you when you return an item to them; as part of their return policy the information on your ID will be captured and entered into a secure database for the purpose of tracking returns. What? Retailers such as Best Buy dabbling into your personal affairs by requiring and capturing ID when you return something? Best Buy, for instance, claims that their policy is to track customer returns as well as to cut down on return fraud; customer information captured is kept in a secure database and the information contained therein is not sold to third parties. To me, Best Buy's return policy (as well as any other retailer requiring and capturing ID) is a recipe for identity theft. Any retailer can institute a legitimate return policy by having the customer fill out a form (which is generated by the register) with the customer's name and address, and the store clerk enters this information into the register. As to Best Buy's claim that the information captured from customer IDs is kept securely, the information will eventually end up being sold to third parties. After all, despite federal laws prohibiting this practice the State of Florida has a habit of selling your name and address information on your driver's license to third parties. If the State of Florida sells your name and address information on your driver's license then I imagine what Best Buy is doing to your information when you return something to them for an exchange or refund. Besides, as I mentioned in a previous blog entry a Florida Driver's License is the worst identity document to have in your possession other than the fact that you need it for driving a motor vehicle. You need it in case a law enforcement officer pulls you over or if you are in an accident. 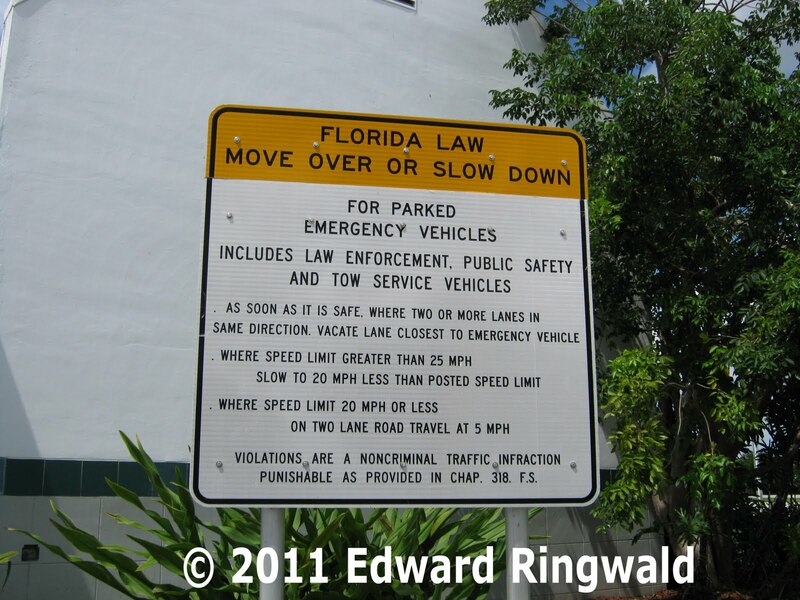 A Florida Driver's License contains - as required by the federal REAL ID law concerning standards for state drivers licenses - your name and your physical street address; in other words, where you live. Besides, a physical street address is a goldmine, not only for nosy and dabbling store clerks when it comes to returns but for stalkers and domestic violence perpetrators who happen to come across your license. So, what can you do to prevent your personal information from being misused at the hands of retailers such as Best Buy? If you happen to have a passport or a passport card, use it as ID. Passports and passport cards do not have your physical street address on them, unlike a driver's license. If you do not have either a passport or passport card, I would strongly recommend getting a passport card. It is a wallet size card and, being a federal identity document, meets REAL ID benchmarks. Not only you can use it when you check in for a domestic airline flight or to enter a federal facility, you can show your passport card as ID if in the event a retailer asks you. Passport cards cost $30 and are good for ten (10) years. If you have a post office box as a mailing address, use it to your benefit. If in the event a retailer requires a street address, give your work street address - not the street address where you live. Again, residential street addresses are a goldmine not only for dabbling store clerks but for stalkers and domestic violence perpetrators too. Remember: If you are asked for ID by a retail store clerk, pull out your passport or passport card if you got one. This solves 99% of all ID required issues when it comes to retailers. 2. If a retailer wants to require ID for a return, that's their business. At least the information from the ID should not be captured and held in a computer database subject to unauthorized access. 3. To law enforcement or to a rental car company, a driver's license is one thing. However, to retailers such as Best Buy, Wal-Mart, CompUSA or any other retailer known to ask for IDs from customers, my residential street address - in other words, where I live - is none of your business. If you have had a horrific experience at a retailer when you went to return an item for exchange or refund, I would like to hear from you. Simply post a comment with your experience (please, no personal identifying information). Christmas time has arrived here at EdwardRingwald.com! I know, it's getting very close to Christmas but I had plenty of other stuff going on. However, the hard work I did this past week alone in getting the elements of my Christmas 2011 page I feel paid off. 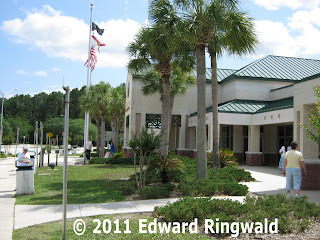 This year I am featuring two locations in St. Petersburg and one location in Plant City. The two locations in St. Petersburg are over at North Straub Park in downtown St. Petersburg as well as the mega-Christmas display located at 2719 Oakdale Street South and the one location in Plant City - a town 20 miles east of Tampa on Interstate 4 and is well known for being the home of the annual Strawberry Festival - is in McCall Park in downtown Plant City. What makes Plant City so special besides the Strawberry Festival is that it is the intersection of two important CSX Railroad lines, the A Line which runs from Tampa eastward towards Lakeland, Orlando, Jacksonville and points north and the S Line which runs from Tampa northward towards Dade City, Wildwood, Ocala and turning northeast towards the town of Callahan located northwest of Jacksonville where it joins up with the A Line. Do you know why these railroad lines are identified as the A and S lines? There's a lot of history to it: The A Line used to belong to the Atlantic Coast Line while the S Line used to belong to the Seaboard Air Line Railroad. Both lines merged in 1967 to become the Seaboard Coast Line Railroad which evolved into today's CSX in the 1980's after a series of railroad acquisitions. So, I am dedicating my Plant City section of my Christmas 2011 page to all the railfans out there, especially those railfans that I either subscribe to or subscribe to my channel out there on YouTube! What are you waiting for? Head on over to my Christmas 2011 page today! A few blog entries ago I reported on the ever increasing Anti-American holiday sentiment, especially around the Christmas and Thanksgiving holidays. More and more school principals - and school districts - are alarmingly shunning Christmas in one way or another. Sound scary, isn't it? Just a few days before Christmas, the Anti-American holiday spirit has struck again - this time, right here in our back yard. As this St. Petersburg Times article from staff writer Tony Marrero indicates, the superintendent of the Hernando County School District, Bryan Blavatt, banned all instances of Christmas from all Hernando County public schools. The reason, according to the article? "To preserve precious teaching time". Bay News 9 also has a similar article as well. Yeah, right. It is to preserve precious teaching time all right - after all, teachers cannot teach an effective class and are instead ordered to do nothing more than drill and practice for the all important FCAT test; nothing more than teach the FCAT test here. No matter why your children in Florida do not get an education in our public schools! Further on in the St. Petersburg Times article, there is one principal in the Hernando County School District that Bryan Blavatt does not have to worry about when he issued his no-Christmas edict: Susan Duval, who happens to be the principal of Springstead High School in Spring Hill. After all, Ms. Duval discourages all forms of Christmas at her school by discouraging anything having to do with Christmas including Christmas parties and the like. After all, Susan Duval is no stranger to controversy surrounding the operation of her school as principal of Springstead High. In 2005, she gave a commencement speech to the graduating class of that year utilizing words taken from other sources and passing them off as if they were her own. The punishment? A letter of reprimand and a one day suspension courtesy of the Hernando County School District, a slap on the wrist so to speak. Despite that punishment, wouldn't you think that Susan Duval is still doing this to every graduation commencement ceremony? That unfortunately I do not know the answer to. I wrote a blurb on Susan Duval and her involvement in the 2005 graduation commencement controversy which you can find over at my copyright topic. With Hernando County Schools Superintendent Bryan Blavatt and Springstead High's Susan Duval apparently taking on an anti-Christmas stance, perhaps a study abroad program in the summer in a country where human rights and civil liberties are grossly violated as well as where the celebration of Christmas is illegal would be appropriate. After all, as long as there is an United States of America in existence Christmas as well as the other American traditional holidays will be around, so get used to it. By now you have probably heard of the United States Postal Service's plan to increase the price you pay for a first class letter from 44 cents to 45 cents effective 22 January 2012, according to this press release from the USPS. That's right, postage is going up unless you happen to have those "forever" stamps that you use to protect yourself from having to put additional stamps on your letter when postage increases. If you think that the United States Postal Service keeps raising postage rates while the quality of service gets poorer, it is. In fact, there is a proposal according to this Bay News 9 article that would slow down oridinary first class letter mail. That's right, ordinary mail such as letters and bills you pay where you just put a stamp on it and mail it off. First class mail has what is called a delivery goal, not to be mistaken with delivery guarantee. First class mail that is mailed in a defined local area is delivered overnight, while first class mail that is destined for outside the defined local area but within the state is delivered in two business days. First class mail destined for out of state is usually delivered in three business days. OK. Let's take an ordinary letter, mailed in St. Petersburg at the St. Petersburg post office that is headed to Tampa. Right now, that letter you mail from St. Petersburg to Tampa is delivered overnight. If the United States Postal Service gets its way, that same letter you mail from St. Petersburg to Tampa will be delivered not overnight, but in two business days. You got that right, two business days. With all the customer complaints and customer issues that have plagued the United States Postal Service, I decided to make this a topic all of its own here at EdwardRingwald.com. What you'll see is based on my experiences when I have to unfortunately deal with the United States Postal Service over the years. The complaints about the USPS range from damaged mail to a letter delivered - especially constantly - to the wrong address. Long lines, especially backed up to the door. Worker's hours - 8 AM to 5 PM, whihch means that you have to take time off from work. And often times, without pay depending on your employer. Poor service by surly, belligerent or rude window clerks. Inadequate tracking information when you need it. Customer service representatives at the USPS' 1-800 toll free number that don't take the time to listen to you, making you repeat it so many times to the point of being annoyed by the representative on the phone. Speaking of the USPS' customer service representatives, I had a poor experience with them a very long time ago, this was back before the Internet and the World Wide Web as we know it today made things a lot easier. I called asking for Zip Code information for a letter and I had the unfortunate experience of speaking with a customer service representative for the USPS that had a foreign accent. The representative kept repeating back information to me wrongly even after I took the time to slowly give the representative the information I needed. Needless to say, I was so disgusted that I hung up the phone on the representative. While we're on the same subject, does the United States Postal Service use overseas call centers in the same manner as other businesses such as Bank of America? Before I got to speak to a USPS customer service representative as I mentioned earlier, I had to do the IVR battle (or the Interactive Voice Response battle) to get through a few options before you are given the option of speaking to a representative. To me, the combination of IVR plus overseas call centers is bad business. So, as you do your holiday shopping (and shipping) before you head out the door to endure the long lines at the USPS be sure to read my new topic on our (un)reliable and (in)efficient United States Postal Service. And by the way, if you have a USPS horror story that you would like to share please feel free to post a reply; just please make sure to keep the comments clean. 1. Make sure that all your credit and debit cards are signed on the back. Don't write "SEE ID" on the back - that statement is not valid as a signature. Besides, merchants have to comply with the policies set by the credit card issuers, and among the policies is that credit card users must sign the back panel of the card prior to use. 2. Keep - in a separate place such as a password protected Word document or Excel spreadsheet - a list of the credit and debit card numbers and the associated toll free telephone number to that card's particular issuer in case the card is lost, stolen, or the number is compromised. Don't keep a printed copy with your cards! 3. Provided you have signed your card on the back as required, merchants have NO right to demand your ID. Why? First and foremost, it is against policies set by the credit card issuers, namely MasterCard and Visa. However, there is one exception: A merchant can require ID if the card is not signed on the back as you are supposed to. Second, a merchant's wanting to know where you live is absolutely none of their business. Merchants such as Wal-Mart (in Florida, we should call them trespass and ban for life happy Wal-Mart) and CompUSA are very notorious for this. A Florida Driver's License is the worst identity document to have in your possession other than the fact that you need it for driving a motor vehicle. You need it in case a law enforcement officer pulls you over or if you are in an accident. 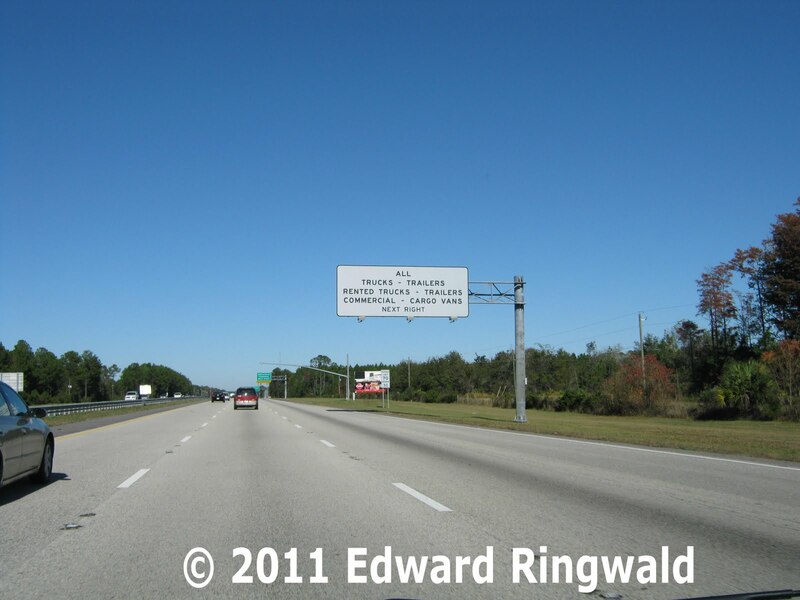 A Florida Driver's License contains - as required by the federal REAL ID law concerning standards for state drivers licenses - your name and your physical street address; in other words, where you live. Besides, a physical street address is a goldmine, not only for nosy and dabbling store clerks but for stalkers and domestic violence perpetrators who happen to come across your license. If you are confronted by a store clerk at the register demanding your ID, you are well within your rights to say no. If the store clerk gets belligerent with you, politely and professionally ask to speak with the store manager. Nine times out of ten a store manager will say that checking ID is their policy to prevent identify theft, but that alone is a false statement. Besides, store clerks themselves have been involved in identity theft cases as the perpetrators! Protecting yourself against identity theft is a straightforward process on your part. We know how to keep our credit/debit cards and Social Security numbers out of the hands of unknown persons, and to check our credit reports once a year. 4. Always check your credit and bank account statements periodically. Notify your bank, credit union or credit card issuer of any inaccuracies. While we are on the subject of ID's, the best American identity document you want to carry around is the Passport Card. Not only it fits in your wallet unlike the traditional passport book, you can use it to cross the Canadian/Mexican border for short trips to Canada or Mexico across our land borders as well as domestically here in the USA to board your flight and gain admittance to federal facilities as the passport card is a REAL ID compliant document. (Remember, a passport card cannot be used to enter the United States by air, even if you are coming from Canada or Mexico - this is where the traditional passport book comes in). And the good thing about a passport card is that it does not reveal where you live, such as your physical street address (unlike a Florida Driver's License or a Florida ID card). The passport card contains the benchmarks required by the federal REAL ID law yet providing a degree of privacy for the cardholder. Better yet, a passport card costs $30 and it's valid for ten years, compared to a State of Florida ID card which costs $25 but is only valid for eight years. Besides, if you have a Florida ID card and you move to another state, you have to end up getting a new state ID card in your new state of residence which means more fees and more hassle at the state DMV, but if you have a passport card it is a federal document good anywhere in the USA. Reminder: If you have a driver's license and you move, be sure to obtain a driver's license in your new state of residence. It is the law in all 50 states! Active duty military pursuant to federal law are exempt, just make sure you have your military ID with you in case you are questioned by a law enforcement officer regarding your out of state driver's license. The U.S. State Department has more details on the passport card as well as how to apply and application forms. Believe me, it's worth the $30! To law enforcement or a rental car company, a driver's license is one thing. But to store clerks such as those at Wal-Mart, CompUSA or any other merchant who has strict ID policies when it comes to using your credit or debit card, my driver's license and where I live is none of your business! 1. If you have a passport card, use it as ID. This takes care of 99% of all ID encounters when retail stores are involved. 2. Leave the items on the counter and patronize a different merchant. And I did not forget Item Number 3: Go to RipOffReport.com and share your experience with that particular store. Also go to ConsumerAffairs.com and share your experience wth that particular store as well. These sites are also great to share your experiences if you have run into rude, belligerent or surly store clerks and you get no satisfaction from the store manager in charge. If you have an unfavorable experience with a belligerent or surly store clerk, especially if ID is demanded of you when you pay for your items at the register, please feel free to share your experiences here by posting a reply. All I ask is that the replies be kept clean and no personally identifying information; your reply will not show up until I have moderated it. Almost a year later: Rick Scott is still Florida's Number One Dictator! Soon we will be approaching the one year aniversary to the day that Florida's 45th Chief Crook Executive, Rick Scott, took office as Florida's 45th Governor. Lately in the St. Petersburg Times The Daily Show's Aasif Mandvi happened to crash not one but two press conferences, one with Rick Scott and the other with Florida's Attorney General Pam Bondi. One of Rick Scott's unpopular acts was to require anyone seeking welfare benefits to submit to drug testing. During both news conferences, Aasif Mandvi asked both Scott and Bondi to submit to a urine sample in the same manner as Florida's welfare recipients. Now why is Pam Bondi trying to do to make life more miserable for us Floridians? First and foremost, right after she took office as Florida Attorney General she made it very hard for anyone convicted of a felony to seek a pardon, even after the prison time and/or probation was served, fines paid, court orders complied with, etc. After all, these people who were convicted felons wanted to put their past behind them and get on with their lives so that they can become productive members of society once more. In short, Pam Bondi wants to make things a lot easier for Floridians - especially law abiding Floridians - to acquire a criminal record upon arrest (yet make it harder to get a pardon or even a criminal record seal/expungement for that matter). That would be simple enough - law enforcement can arrest a person on trumped up charges of trespassing after warning (using the recent arrests of members of the Occupy Movement in Tampa and Orlando as great examples) and find ways to upgrade the charges to felony charges. Simple trespassing charges in Florida Statute 810.09 are misdemeanor charges. However, the law goes on to state that if you are even caught within a certain distance of a specified property (and I do not mean going onto the specified property itself), the misdemeanor trespassing charges become felony trespassing charges. Even if the charges are later dropped by the State Attorney or if you are found not guilty in the courts, you still have an arrest record. You can go through the hoops with the Florida Department of Law Enforcement to have your record sealed or expunged, but most people don't do it due to the high cost among other things. And one more thing: A St. Petersburg Times reader whose name is Fighting Irish replied to my comment. Although he disagreed with my comparison between Rick Scott and Adolf Hitler, still he agreed that Rick Scott is doing everything to destroy our great state. Be glad we live in America and in a free country where we have freedom of speech and freedom of lawful expression. In Thailand, freedom of speech and freedom of lawful expression are less than half-existant; an American was recently arrested in Thailand for violations of their very strict lese majeste laws, which mean one can be arrested and jailed for criticizing the Thai Royal Family. Just imagine for a moment if Florida was an independent nation and we had Thai style lese mejeste laws: Our jails and correctional facilities would be extremely overcrowded with people arrested and convicted of criticizing Rick Scott. Just be glad we don't sing Phleng Chat - the National Anthem of Thailand - at a Tampa Bay Rays home game at Tropicana Field! Just a reminder of what a way of life we Floridians have to endure under a governor that does not care about the people and now an attorney general that will not go after the real criminals: The people in Florida who are responsible for the real estate and mortgage crisis that sent property values downward and put millions of Floridians underwater on their mortgages. 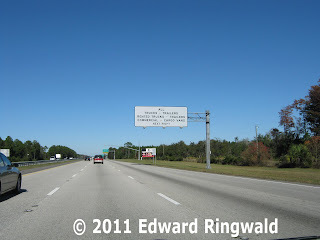 Just remember this blog entry the next time you pass by the Welcome to Florida sign at the Florida Welcome Center on Interstates 75 or 95 when you cross into our great state. This past Thanksgiving weekend I decided to not mess with the Black Friday crowds and instead take a jaunt over to Jacksonville. While there I did some sightseeing including taking a side trip over to Folkston, GA and the famous "Folkston Funnel", where practically all trains from the country have to pass through on their way to Florida with the exception of trains coming from the west. I stopped at the Florida Welcome Center - not once, but twice - just to get that welcome home feeling coming back from Georgia. 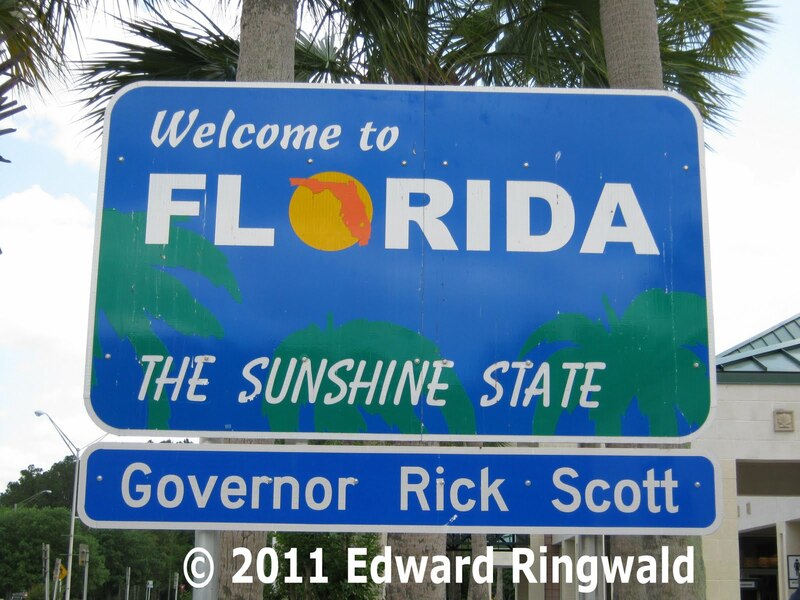 Unfortunately, the Welcome to Florida signage bears the name of our 45th Chief Crook and Executive Thief of the State of Florida, none other than Rick Scott. 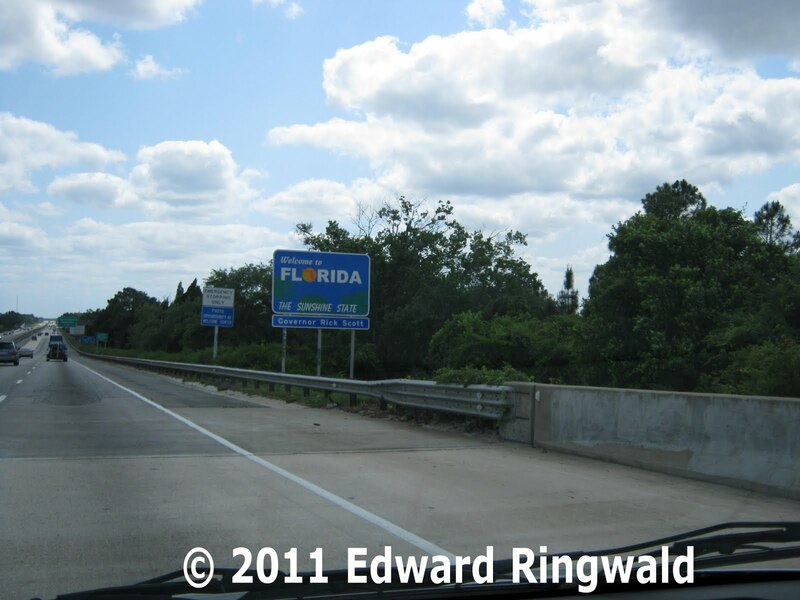 It really tiffs me to even have to see the Welcome to Florida sign with Tricky Ricky's name on it - since it's posted right at the state line, you can't avoid it one bit. 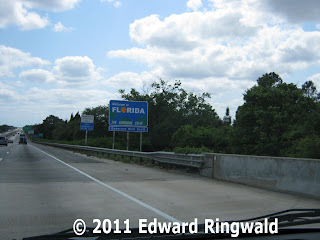 So, while I was at the Florida Welcome Center on southbound Interstate 95 north of Jacksonville, I pulled out my trusty BlackBerry and jotted down ten items that you, as a Florida resident returning home or a visitor coming to enjoy the Sunshine State, know that you have arrived in the great State of Florida! 10. You stop at the Florida Welcome Center on I-75 or I-95 and pick up your obligatory sample of orange juice. 9. 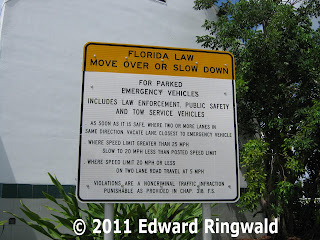 Move over or slow down for emergency vehicles. 8. Our great state's Interstate shields are better to read than Georgia's. 7. Our Interstate highway overheads are much better than Georgia's. 6. 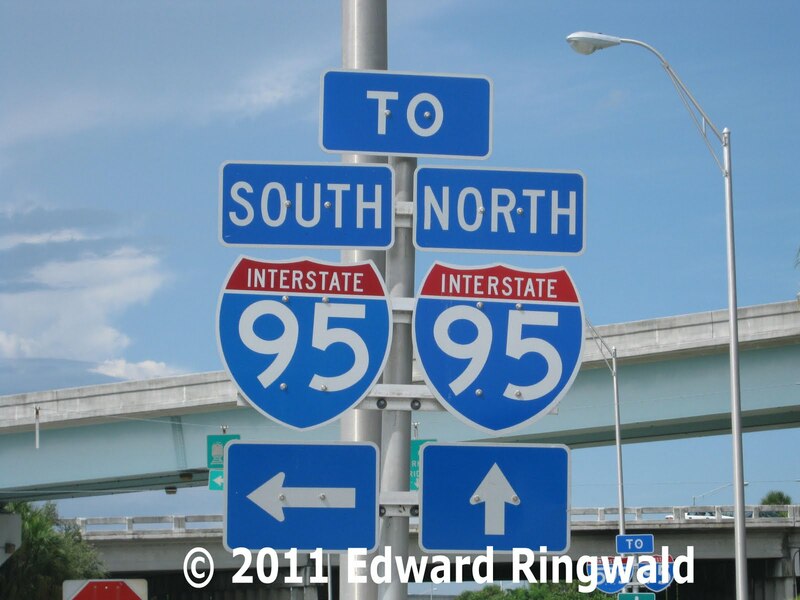 Home of the Florida merging traffic symbol. 3. Your children are learning new words in their vocabulary: Foreclosure and homelessness. 2. Cash or your state's EZ-Pass is worthless when you drive onto the Florida Turnpike or practically any toll road or bridge in Florida for that matter. 1. You see our Chief Crook and Thief's name, Rick Scott, plastered on every Welcome to Florida sign at our welcome centers as well as every port of entry into the great State of Florida! And you, the Florida taxpayer, spent $7,000 to let Tricky Ricky make an idiot of himself on every Welcome to Florida sign! 1. The disposal of 25,000 potential jobs by rejecting the high speed rail money. 2. The voters of this great state elected a crook and a thief (HCA, anyone?). 3. 10%+ unemployment rate in Florida. 4. Foreclosures driving down house values. 6. The turning of law enforcement against the people. 7. Everyday, law-abiding citizens arrested on trumped-up charges, such as trespassing after warning. 8. Turning public property into private property. 9. Your children receive nothing more than drill and practice for the FCAT test instead of a quality education you pay for with your tax dollars. 10. More and more public schools in Florida keeping you, the parent, out of your child's educational progress by using threats of trespass warnings against the parents (does Mike Rio and Virgil Mills Elementary School in Ellenton ring a bell?). So, there you have it. Now that Thanksgiving 2011 has come and gone and that the holiday season is well underway, enjoy the holiday season! The holiday season has begun – and earlier than usual! Here in the Tampa/St. Petersburg area you can tell that the holiday season has begun when WWRM-FM 94.9 switches their format from their regular easy listening music to all Christmas music, claiming to “get you into the holiday spirit”. Ironically, WWRM – dubbed as The New Magic 94.9 – is on the same FM frequency as Radio Veseljak in Ljubljana, Slovenia: Although Tampa and Ljubljana are at least 6,000 miles and an ocean apart, the difference is that Radio Veseljak is only 1 kW while WWRM has a power level (97.3 kW) almost 100 times more than Radio Veseljak. Sure, The New Magic 94.9 FM wants to get you, the Tampa/St. Petersburg area radio listener, into the Christmas spirit – just a few days after the national test of the Emergency Alert System, which turned out to be way far from perfect. Besides, WWRM – along with WMTX 100.7 FM, known as Tampa Bay’s Best Music Variety – are what are called Local Primary stations for the Emergency Alert System in the Tampa/St. Petersburg area. In a national alert, these two stations pick up the alert message from either WFLF 540 AM in Orlando (which is one of many Primary Entry Point stations around the country and one of three in Florida) or from National Public Radio via satellite (using their “squawk” sub-channel) and redistribute the message to the rest of Tampa’s radio and TV outlets as well as cable systems such as Bright House Networks. Hey, I got to admit it, this is my favorite time of the year. Even after losing my mother 11 years ago, it still is. However, I have seen a disturbing trend of anti-American holiday sentiment going around; Andrew Dart has a great page about the Anti-Christmas and Anti-Anti-Christmas Sentiment in American Society over at his web site. Psst! In fact, why don't you read Andrew Dart's Anti-Christmas page by opening the link to the article as shown above as a new tab (simply right click on the link and select Open In New Tab); that way you can read Andrew Dart's well written page and my blog entry (the blog entry you're reading now) side by side. 1. Heathrow Elementary School in Heathrow, Florida (a small town just outside Orlando, not the airport in London) banished everything Christmas, including Christmas colors, from the school on the orders of its principal. The reason was that people may be offended. 2. Battlefield High School in Manassas, Virginia also banished everything Christmas on the orders of its principal, Amy Etheridge-Conti. Several students were disciplined for being members of the “Christmas Sweater Club”; the reason for the discipline was that students did not want Christmas cheer. Apparently, Ms. Etheridge-Conti did not want anything to do with Christmas and she wanted to shove her anti-American holiday season beliefs on Battlefield High’s student body. As I mentioned in my previous blog entry, if you are reading this, Ms. Etheridge-Conti, if Christmas or the holiday season offends you in any way please consider buying an one-way airline ticket out of the country, especially to a country where the celebration of Christmas (or any American holiday for that matter) is illegal such as North Korea, China or Saudi Arabia. As the holiday season draws nearer, another school has adopted its stance of anti-American holiday spirit and this time it involves more than Christmas - and I mean much more than Christmas. This article from FOX 25 in Boston caught my attention before I hopped in my car for the brief trek on Interstate 275 to my office in downtown St. Petersburg: Somerville Principal: Fall Holidays are Insensitive. What? Fall (and Winter) holidays – Columbus Day, Halloween, Thanksgiving and Christmas – are insensitive? What is going on here? According to the FOX 25 article, the principal of Kennedy School, Anne Foley, sent a letter to faculty reminding them that they need to be careful about celebrating the fall holidays such as Thanksgiving. In essence, the fall holidays – Columbus Day, Halloween and Thanksgiving plus Veterans Day and Christmas as they are fall holidays too – were banished on the orders of Ms. Foley and these holidays were not to be celebrated in school. Although Christmas is a winter holiday, I lumped it in along with the rest of the preceding holidays as the fall holidays for the sake of simplicity. At a most recent check of the Kennedy School's website as I am writing this blog entry, it appears that school was held on Thanksgiving week until 12 Noon on Wednesday, 23 November 2011. By comparison, the Pinellas County School District is closed for Thanksgiving week, giving students, faculty and staff a well deserved week off for a major holiday such as Thanksgiving. Similarly, The Boston Herald has a great article on what is going on at the Kennedy School too. By the way, Kennedy School is a K-8 school (which incorporates both elementary and middle schools) located in Somerville, Massachusetts. Somerville is a suburb of Boston located just west of Interstate 93. 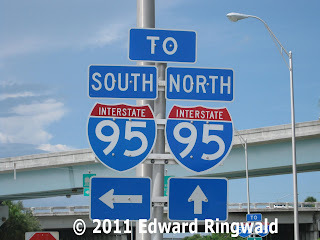 If you are wondering why Interstate 95 does not serve Boston proper, it is because of a freeway revolt which caused Interstate 95 to be routed onto the MA 128 loop that skirts the Boston metro area, much like how Interstate 75 is routed around but not through Tampa. Columbus Day is a federal holiday in which the federal government (including the US Postal Service) and banks are closed. Observances of Columbus Day by state depends on the state involved; I am not sure if Columbus Day in Massachusetts is a legal holiday but here in the great State of Florida, Columbus Day is an unofficial holiday in that state, county and city offices are open for business. Halloween is an unofficial holiday, celebrated by children trick or treating in the neighborhood and Halloween costumes. The only entities I believe that do not observe or celebrate Halloween are religious sects that believe that Halloween is a holiday associated with witchcraft among other things. Thanksgiving Day is an official holiday all across America. We celebrate Thanksgiving by going to relatives for Thanksgiving dinner among other things, not to mention the Macy's Thanksgiving Parade in New York City, televised across the country on your local NBC affiliate. The Day After Thanksgiving is considered a holiday depending on who you work for (for instance, if you work for a local government such as the City of St. Petersburg, the Day After Thanksgiving is one of 10 city holidays observed throughout the year as all city offices are closed); it is also known as Black Friday and the start of the Christmas holiday season. Thanksgiving Day, along with Christmas Day, is supposed to be a day of rest for most of us. Finally, Christmas Day needs no introduction. We know what Christmas day is: Christmas lights, Santa Claus, Christmas trees, Rudolph the Red Nosed Reindeer … and the Christmas traditions go on. Christmas is not only just an American holiday; Christmas is celebrated worldwide save for a few countries where human rights and civil liberties are grossly violated. What I can say is this: The fall and winter holidays of Columbus Day, Veterans Day, Thanksgiving and Christmas as well as Halloween – plus the other holidays of the year such as Memorial Day, Independence Day, Labor Day, Martin Luther King Day, Presidents Day and New Years Day – are a part of the American way of life. As such, these holidays and traditions will continue to be around, as long as the United States of America is in existence, so get used to it. As for Anne Foley, Principal of Kennedy School in Somerville, MA, may I offer you some words of suggestion for the anti-Americanism you have forced on your faculty and students? 1. Take down the flags of both the United States of America and the Commonwealth of Massachusetts that fly in front of your school. Next, hoist the flag of a country that does not celebrate Thanksgiving and Christmas, preferably a country where human rights and civil liberties are grossly violated. 2. Next, ban any recitation of the Pledge of Allegiance to the American Flag. While you’re at it, ban any singing of The Star Spangled Banner on your school campus. Instead, play the national anthem of the country you have chosen that is represented by the flag you have hoisted on the flagpole in front of your school on your school’s closed circuit TV system every morning as a part of your school's morning announcements. Have your students learn the words to the national anthem of the country you have chosen too. If that does not work for you, and if American fall/winter holidays including Thanksgiving and Christmas continue to offend you in any way, then I have another suggestion for you: Purchase a one way airline ticket from Logan International Airport in Boston to a country where human rights and civil liberties are grossly violated, such as Belarus, Cuba, China, North Korea or even Saudi Arabia. Besides, celebrating any American holiday in Saudi Arabia is illegal! As I mentioned in another previous blog entry, there are school principals unfortunately that control their schools much like the governments of Belarus (think Alexander Lukashenko), Cuba (think Raul Castro) or the closed world of North Korea run by Kim Jong-Il. Why? Your parental rights are trumped and usurped while your children are in school; try to “interfere” with your child’s education and you can get arrested and your child taken into the custody of the Florida Department of Children and Families (the Florida DCF, also called the Florida Department of Complete Failure) or, at the least, turned into a second class citizen and trespassed which banishes you from school property, perhaps forever. OK. Let's change gears a little bit while we're on the subject of anti-American holiday sentiment. Now for another alarming trend of anti-American holiday sentiment, this time on the Corporate America front: Businesses that used to be traditionally closed for Thanksgiving are opening their doors, all in the name of profit. Thanksgiving and Christmas are two very important holidays in which people rest and be with their families, celebrating the spirit of the season. Unfortunately, Corporate America wants to cash in on greed, especially with the Day After Thanksgiving (more commonly known as Black Friday), and open businesses either at 12:01 AM on the Day After Thanksgiving or, worse, open on Thanksgiving Day. The newest offender on the block as far as being open the Day After Thanksgiving is Target. In order to get a jump start on the holiday shopping season, Target decided to open its stores at 12:01 AM on the Day After Thanksgiving. While Target may be closed on Thanksgiving Day to the public, unfortunately their associates have to work on Thanksgiving in order to prepare for the biggest shopping day of the year. The result: Target’s associates cannot be with their families for Thanksgiving Day. Whoa! Work on Thanksgiving Day? First, I can understand that our police officers, firefighters and public safety personnel do have to work not only on Thanksgiving Day, but any holiday of the year for that matter. After all, we rely on these fine personnel to keep us safe. However, I am miffed when I find out that a retailer – especially a retailer known for traditionally closing on Thanksgiving so that their employees can be with their families – decides to open their doors on Thanksgiving Day all in the name of making a quick buck. Does Corporate America care anymore about America’s traditional holidays? Being open on Thanksgiving Day is fairly new. Here in the Tampa/St. Petersburg area, we have businesses that are traditionally closed on Thanksgiving Day so that their employees can be with their families. A great example is Publix Super Markets, which has had a closed on Thanksgiving Day policy from the day George Jenkins founded Publix a long time ago. Unfortunately, two other supermarkets in the Tampa/St. Petersburg area - Sweetbay Supermarket and Winn-Dixie – are open on Thanksgiving Day. Sweetbay claims that they are open on Thanksgiving for customer convenience, but Sweetbay’s Belgian owners – Delhaize Group – apparently believes that Thanksgiving is an interruption to their business. While Sweetbay may be open as a customer convenience, in reality their associates cannot enjoy quality time with their families on Thanksgiving. Besides, Belgium does not celebrate Thanksgiving as it is not one of their legal holidays, period. Thanksgiving, being mainly an American holiday, is celebrated in a few other countries around the world, but with different traditions and on different dates. Sweetbay used to be known as Kash ‘n Karry, which was locally owned here in Tampa for many years. Then Belgian based Delhaize Group came into town in 1996 and bought up the Kash ‘n Karry chain, remodeled the stores, and rebranded them as Sweetbay as we know today. Practically the same thing is over at Winn-Dixie. Besides being open for Thanksgiving in the name of customer convenience, Winn-Dixie is notorious for poor customer service: Rude and belligerent checkout staff as well as forcing you to surrender your personal information if you want lower prices or you are subjected to substandard treatment as a customer. In other words, the person ahead of you with a Winn-Dixie Customer Reward Card gets better treatment while you, with no card (being your choice), are subjected to more harsh and belligerent treatment. (In fact, Winn-Dixie's way of dabbling into your personal business has gotten more severe: When you go to pay for your items at the register with your debit card, the cashier belligerently and brashly asks you "debit or credit?" Until recently, Winn-Dixie never asked that when you pay for your groceries with your debit card. To me, Winn-Dixie's way of asking you how you want to pay is none of their business - Publix doesn't even do a thing like that). Like Sweetbay, Winn-Dixie’s associates end up paying for being open on Thanksgiving Day in that they cannot enjoy quality time with their families on Thanksgiving. Let’s head over to McDonald’s, also notorious for poor customer service (especially the McDonald's restaurants in the Tampa/St. Petersburg area that are owned by the Caspers Company). Traditionally McDonald’s says on their hours of operation when you walk into the restaurant: “We rest on Thanksgiving and Christmas”. Not so. I have seen McDonald’s open on Thanksgiving morning only for breakfast, but I am seeing that being extended into a full day. Seems like Thanksgiving is more and more being placed on the backburner nowadays. What is going on here? 1. Being a native born American citizen, I firmly and strongly believe in all the holidays that America celebrates, including the major fall holidays of Thanksgiving and Christmas. 2. If schools do not want to celebrate any of the holidays, then consider holding school on these holidays such as Thanksgiving. 3. If Corporate America does not want to have anything to do with Thanksgiving, then have your corporate eons lobby Congress to repeal Thanksgiving as a national holiday. Believe me – it won’t happen; Thanksgiving is deeply rooted in tradition as an American national holiday to begin with, going back to the days when the Pilgrims landed on Plymouth Rock in 1620 and earlier when Juan Ponce De Leon landed on the Florida east coast near St. Augustine in 1513. 4. Thanksgiving and Christmas are holidays to be with family and friends. As such, I do not conduct any business on Thanksgiving as well as Christmas. 5. Finally, if the spirit of the American holidays – especially the fall holidays such as Thanksgiving and Christmas – offend you in any way, please consider leaving the United States of America and find another country where our American holidays are not celebrated, especially a country where human rights and civil liberties are grossly violated. We cannot let the fall holidays including the major holidays of Thanksgiving and Christmas become endangered, thanks to public schools and Corporate America that think these holidays are a nuisance. Thanksgiving and Christmas - along with America's other major holidays - are not a nuisance; instead our nation's holidays are part of our heritage. So, onward with Thanksgiving, Christmas and the holiday season! Many of you out there may have watched the video of Aransas County (Texas) Judge William Adams savagely beating his daughter, Hillary. I had the courage to watch all seven minutes of the video which has gone viral worldwide thanks to YouTube. First, I want you to watch the video below of this savage and cruel act committed against Hillary, who was attending high school as this video was made according to media reports. WARNING: The video seen here is graphic and it involves strong language. Viewer discretion is strongly advised. This is my opinion in a nutshell: Horrific, shocking, disgusting and violent. As I posted in a comment for that video on YouTube, this is definitely not a case of parental discipline - instead, this is a case of aggravated child abuse. Just recently here in Florida the Florida Supreme Court ruled that one spank is not considered domestic violence. To me, what the Florida Supreme Court did was have parents declare open season on their children, free to carry out any act of violence against children including spanking as long as no marks were left, and all in the name of parental discipline in the home. Want the facts? Turn on Bay News 9 or 10 News (WTSP-TV) and this is becoming more and more common: Boyfriend arrested for child abuse. This story from Bay News 9 proves the point: A Seminole man beat his girlfriend's child to death in Lakeland, all because the girlfriend (who was the child's natural mother) did not believe in the use of violence when it came to parental discipline, including spanking. That article from Bay News 9 is just only a sample of what's going on. There are more articles out there dealing with child abuse right here in our own backyard. Want proof? Go to Bay News 9 as well as 10 News and do a search for "child abuse" - you will be surprised. Austria outlawed corporal punishment in 1989. Croatia outlawed corporal punishment in 1999. Denmark - Sweden's neighbor to the west via the Oresund Bridge - outlawed corporal punishment in 1997. Finland outlawed corporal punishment in 1983. Germany outlawed corporal punishment in 2000. Greece outlawed corporal punishment in 2007. Hungary outlawed corporal punishment in 2004. Iceland outlawed corporal punishment in 2003. Latvia outlawed corporal punishment in 1998. Luxembourg outlawed corporal punishment in 2008. The Netherlands (Holland) outlawed corporal punishment in 2007. Norway outlawed corporal punishment in 1987; the Norwegian Supreme Court ruled in 2005 that even a light "careful" slap is illegal. Poland outlawed corporal punishment in 2010. Portugal outlawed corporal punishment in 2007. Romania outlawed corporal punishment in 2004. Spain outlawed corporal punishment in 2007. Ukraine outlawed corporal punishment in 2004. When I mean that corporal punishment is outlawed, corporal punishment in a country that has completely outlawed the practice is outlawed, period. Just ask Giovanni Colasante, an Italian politician from the town of Canosa di Puglia, who was on vacation in Stockholm with his son when he pulled his son's hair for not going into a Stockholm restaurant as a form of punishment. Mr. Colasante learned his lesson the hard way when he got arrested in Stockholm and was convicted for violating Sweden's corporal punishment ban. The incident created a big uproar in Italy, where corporal punishment is only outlawed in the schools but legal in the home, reports Radio Sweden. Many countries in Europe have completely outlawed corporal punishment. But not in the United States of America, where corporal punishment in the home is completely legal. What Judge William Adams did to his daughter, Hillary, was horrific but it's legal in all 50 states of the United States. However, if you are considering taking a trip with your family out of the country, say to Europe, be careful. As American citizens, we take everything for granted including the right to raise our children the way we see fit with minimal legal restraint. However, once you leave the United States our Constitution and our laws do not follow you - once you are in a foreign country, you are their guest and, as such, are expected to follow and obey their laws including bans on corporal punishment anywhere. As the United States State Department warns in their travel advisories, once you are arrested in a foreign country you become subject to the judicial system of the country you are arrested in. The fact that you are American and the fact that you have an American passport does not exempt you from a foreign country's laws when you are there. That means if you spank your child in a country where corporal punishment is completely outlawed and you get arrested, you will be processed as an inmate according to the judicial system of the country in question. While corporal punishment may be legal in the State of Florida, it is prohibited in one place: The Pinellas County School District. In fact, according to the District's Student Code of Conduct as to disciplinary action that can be taken against students (quoting directly from the Student Code of Conduct): "The use of corporal punishment is prohibited." Further, the policy goes on to state that (again, quoting directly from the Student Code of Conduct) "The prohibition against the use of corporal punishment also extends to parents or guardians on school grounds." In a nutshell, corporal punishment of your children is legal in Florida and in Pinellas County. Just don't spank your children in a Pinellas county public school. Even if corporal punishment of your children is legal in Florida, in reality you might not want to use physical violence against your children because doing so can attract the attention of the Florida Department of Children and Families (DCF). I call them the Florida Department of Complete Failure, but this agency is very quick to do anything to take your children away from you. For instance, let's say your child brought home a report card with D's and F's. You get upset, which is natural. However, you get so upset that you go ahead and spank your child using an object, such as a belt. The next day, you send your child off to school and you have a conference with your child's teachers in mind to see what is going on in school that caused the poor grades to begin with. Suddenly, the phone rings. It's your child's school, with an urgent message that you need to come to the school as soon as possible. You ask why, but the school personnel cannot tell you. Once you arrive at school, you show your ID and sign in per school policy but when a staff member greets you, you are shown down the hall to a conference room where your child's school principal, a police officer, and an investigator from the Florida DCF are there. The reason: The spanking you gave to your child the day before for that poor report card left behind visible welts on your child; one of your child's teachers noticed difficulty in your child sitting down at his desk and took him down the hall to the school nurse. The school nurse saw the welts you made as a result of spanking your child and informs the school principal, who in turn notifies DCF and police resulting in both showing up. Your nightmare as a parent has just begun. Your child is being taken into protective custody by order of the DCF and you, the parent, is being arrested on charges of child abuse. The police officer places handcuffs on you behind your back and you are placed in the back seat of the police cruiser, transported to the county jail to be booked on the child abuse charge. Not only do you, the parent, now have an arrest record for child abuse, if the charges are later dismissed by the State Attorney your nightmare still continues. You can try to get your arrest record expunged, but your name will more than likely be entered into Florida's abuse registry as a child abuser. Simplest explanation: If you go on to apply for a job later on down the road, and that background check includes a check of the Florida abuse registry, chances are you might not get the job you want, all because of your decision to discipline your child by physical means. Moreover, if the charges against you for child abuse are dropped and your child is eventually returned to you, welcome to a lifetime of harassment by the Florida DCF. After all, DCF involvement in your child's welfare is frequent. I am not sure what the laws and procedures are in Texas when it comes to child abuse and mandatory reporting by certain personnel such as school officials, but did Hillary Adams report the savage beating to school officials when she was in high school when the beating took place? What would have happened if Hillary told her school principal and in turn made required reports to the appropriate state agencies in Texas? Unfortunately, these questions we don't know and we won't even know. In light of the video of Hillary Adams being savagely beaten by her father, Judge William Adams, our state legislators - both in Florida and Texas as well as everywhere else in the United States - need to take a second look at corporal punishment, both at the school level and at the home level. I think a Sweden-style law banning corporal punishment in any form - whether it may be in school or by parents in public or private - is in order. After all, corporal punishment is completely banned in many European countries, and it's time in America to put an end to violence against children even if it means banning corporal punishment completely. After all, in Florida if you hit, touch or strike another person you can be arrested on a charge of misdemeanor battery. If the person you hit happens to be a police officer or a specified person listed in the Florida Statutes, then it becomes a felony. But you, as a parent, can get away with it by hitting your own children without risk of being arrested (just make sure no visible welts or bruises are on your child to avoid possible DCF involvement). Corporal punishment has no place in the home. Corporal punishment has no place in the school. Corporal punishment has no place - anywhere. Corporal punishment teaches children that it is OK to solve problems with violence. In other words, corporal punishment teaches children that it is OK to hit other people to solve problems. Corporal punishment needs to be illegal anywhere in America. It's already illegal in most European countries. Parents have a duty to raise their children as they see fit, within reason. The doctrine of minimal interference by government as far as America is concerned I think should come to an end. NOTE: Comments have been closed for this blog entry. As we recently observed the tenth anniversary of the attacks of 11 September 2001 which has changed our lives forever, millions of people across America and around the world have been touched by what happened in one form or another. For me, it was like replaying the Sunshine Skyway tragedy on 9 May 1980 magnified 1,000 times. Please let me share with you what I felt on that fateful day which we will remember for generations to come. I am going to share this with you in two parts: The first part will be my personal experiences on 9/11 and the second part will be life since 9/11, which I'll post at a later date. That said, here we go. A week earlier, I took a trip to Ft. Lauderdale over the Labor Day weekend. I took Amtrak south from Tampa to Ft. Lauderdale and on the Labor Day holiday in 2001, I flew Southwest Airlines from Ft. Lauderdale-Hollywood International Airport (FLL) (and I remember back in the days when Southwest was located in Concourse F of Terminal 3; a couple of years later Southwest moved into its new home at FLL in Concourse B of Terminal 1) to Tampa International Airport (TPA). The flight lasted a little under an hour from gate to gate; believe me, flying Southwest sure beats the five to six hour drive on Interstate 75, especially the section from Ft. Lauderdale to Naples known as Alligator Alley. Fast forward a week later. The date: Tuesday, 11 September 2001. The place: Downtown St. Petersburg, at my office. The time: Sometime around 9 AM. I was doing the morning project filing as part of my first tasks when I got into the office so that I can tend to any priority items that may come up later during the day. My co-worker, Leslie, just came back from her morning break; as I was doing the project filing Leslie came up to me and told me that one of the towers of the World Trade Center in New York City just got hit. I said to myself, “I couldn’t believe it!” I went over to the conference room located down the hallway and the TV was already on. My worst fears were being played before my eyes: Not only one tower of the World Trade Center was hit; the second tower of the World Trade Center was hit too. Then I kept hearing that The Pentagon in Washington, DC got hit, and another airliner – which we would know as United Airlines’ Flight 93 – was on course for either The White House or The Capitol. By that time, for all intents and purposes America was under attack. Going back to my desk, I was deeply concerned. With New York City and Washington DC being attacked by airliners – hijacked by teams of terrorists – I was scared if Florida was next. Would it be Miami/Ft. Lauderdale? Orlando? Jacksonville? Tampa/St. Petersburg? An hour later, I went on my morning break. Already the St. Petersburg Times was printing an extra edition with huge headlines: AMERICA UNDER ATTACK. I picked up a copy and read it in the conference room while the TV was on. As I was reading the paper, I saw a horrific tragedy play before my eyes on TV: One of the World Trade Center towers collapsing. Then the other tower collapsed. Believe me, this was like the Sunshine Skyway tragedy on 9 May 1980 as the Summit Venture plowed into the south anchor pier (Pier 2-S) causing the southbound span to fall into Tampa Bay being replayed in my mind over and over. Back in 1980 you did not have digital video for instantaneous playback. You did not have live video like we do today (besides, live video from a broadcast TV station’s remote truck was just getting off the ground). Broadcast video technology has improved over the 20+ years between 1980 and 2001: We now have 24-hour news channels that report breaking news the moment it is received, such as Bay News 9, the 24-hour local news channel in the Tampa/St. Petersburg area. Later on after I returned to my desk, I found out that all airplanes were being directed to land at the nearest airport. United States airspace was being closed to all air traffic nationwide, as we were experiencing for all intents and purposes a national emergency. Then the theme parks such as Disney World in Orlando were closing for the day and everything else was either curtailing operations or shutting down because of the tragic events taking place. However, my office remained open as we had an obligation to serve the public. What about the international flights from Europe coming to America? Once American airspace was closed to all commercial air traffic that fateful morning, it became a logistical nightmare as flights were being diverted to major Canadian airports as a part of Operation Yellow Ribbon; Gander International Airport in Newfoundland was the most notable airport as it played host to 38 airliners according to the Operation Yellow Ribbon article on Wikipedia. To handle the diverted air traffic, Canada closed its airspace to departing aircraft. After all, this is the spirit of our Maple Leaf neighbors to the north assisting us in an hour of need. At the end of the day I took the bus home. Once I got home I had my TV turned on primarily to Bay News 9 but if I were to flip around the channels, I noticed that a lot of the cable networks which were not news related were either relaying live wall to wall coverage of the tragedy that unfolded or with a static slide stating that the station was not on the air due to the national emergency that was taking place. Speaking of a national emergency, where was the Emergency Alert System on 11 September 2001? From what I understand activation of the Emergency Alert System on a national level was not needed as the broadcast and cable stations across the country were providing the warning. Furthermore, I found out that the 34 Primary Entry Point radio stations around the USA were kept on high alert, just in case. Do you know what a Primary Entry Point radio station is? If and when the President of the United States (no President has done this to date) orders an activation of the Emergency Alert System (EAS) on a national scale, a nationwide code - called an EAN, which stands for Emergency Action Notification - is transmitted from The White House to FEMA. FEMA relays this notification to the 34 radio stations across the USA that are part of the Primary Entry Point system. Once a Primary Entry Point radio station receives this alert it must be relayed to other radio stations as well as TV stations and cable systems; at the same time normal programming is suspended until the conclusion of the emergency. The ultimate goal: To have the President of the United States address the nation within 10 minutes of activation. Sporting events such as football and baseball (especially since baseball was in its last month of regular season play as the playoffs leading to the World Series was just around the corner) were cancelled for a while as a result of 9/11. For the next few days after 9/11 our America was in a state of shock and sorrow. However, here in St. Petersburg we had another event we had on our minds in addition to 9/11: Tropical Storm Gabrielle, which caused heavy rain and street flooding. The next week - Monday, 17 September 2001 - was nothing but normal as America tried to recover from the shock and horror of the day that will live on in our minds forever. A couple of days earlier, some airliners were returning to the skies amid tightened airport security. In the days since 9/11, our way of life in regard to how you and I go about our everyday business has radically changed. Unfortunately, these changes have come at the price of sacrificing the freedoms we Americans enjoy and are accustomed to. In Part 2 of my blog entry on 9/11: Ten Years Later I will discuss life that we are accustomed to since that fateful day. By the way, if you have a 9/11 related story you would like to share, please feel free to post a reply. Just make sure that your post is clean; all posts are moderated before they are published.